Colorado State traveled to Laramie for an October 2nd matchup of the Border War. Many CSU fans made the trip and filled up about 40% of the crowd. Despite the fan dedication, CSU disappointed and dropped the match by a set score of (3-1). Anyone in attendance would confirm, sets 1 and 2 lived up to expectation and consisted of a back and forth battle resulting in a (1-1) tie. After CSU dropped set one (19-25) and took set two (25-18) the teams switched sides and headed out for an important set three. Wyoming went up early and never let off, and after several different runs of 3, 4, and (5-0) took the set by a score of (25-14). After the demoralizing blow of set three, CSU put up little resistance in set 4 but lost (25-18). Why was Wyoming so successful? 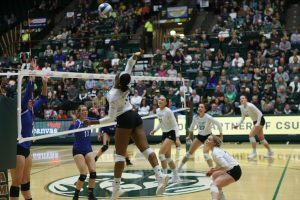 They exploited the number one weakness Colorado State has encountered this year, defending middle blockers. The top three Wyoming attackers Jackie McBride (10 of 20, 1 error), Faith Waitsman (9 of 21, 2 errors), and Reed Copeland (7 of 15, 1 error) were all middle blockers. Copeland, a junior has been a thorn in CSU’s side for a couple years now, but Waitsman and McBride were given additional set-ups by Cori Aafedt due to CSU’s extreme susceptibility to attacks up the middle. Wyoming didn’t hurt themselves, but they also didn’t play especially well. In fact, CSU hurt themselves more often than Wyoming did. An obscene 30 attack errors, 10 service errors, and multiple violations (Net, Over the Net) gave Wyoming nearly two sets of free points. It wasn’t all bad though, Paulina Hougaard-Jensen got hot late and ended the match 15 of 27 with 5 errors, hitting 0.370. Katie Oleksak had two service aces and totaled 46 assists in the match. CSU also had three players total double digit dig numbers: Oleksak, Oliva Nicholson, and Maddie Foutz. With the bulk of the Mountain West Conference schedule still to play, CSU will definitely look to clean up their game as their hopes to take home another conference championship are still alive. The stage was set for an epic showdown for Mountain West heavyweights. Air Force was (12-6) while the CSU Rams were (11-6). Both teams have recently lost to Wyoming in Laramie; CSU got beaten handedly in 4 sets, losing by an average of 7 points in their 3 losses. Air Force faired a little better going to all 5 sets vs Wyoming, winning the first 2, before falling in the next 3 sets. CSU was ending a 5-day stretch with 3 games, one in California and one in Wyoming before finally returning home. Air Force was on the road finishing in the CSU’s Moby Arena. Air Force had struggled on the road with just a score of (1-3) while the Rams had a (5-2) record at home. The stage was set for a great showdown. CSU came out quickly with a kill by Hillyer. She would then go on to have a whopping 7 kills in the first set with a total of 11. While the Rams were rolling, the Air Force was having a tough time getting off the ground, committing 4 service errors in the first half as well as allowing 3 service aces. To make matters even worse star Falcon player Denise Ssozi left the match in the middle of the first set with what appeared to be a pretty serious lower body injury. Ssozi who was averaging just over 3 kills a set, leading the team in kills, while simultaneously being second on the team in digs behind only the defensive specialist Sarah Hellman. Ssozi went down at a score of CSU (21-17). The Rams would go on to win that set (25-18), it would seem the Falcons struggled to find the energy needed to finish off that set without Ssozi. The second set started off hot with the Rams coming out to a (4-0) lead and never lost it. The closest the Falcons got to catching the Rams was when the score was (4-7). The Falcons would make 11 errors in this set including 4 service errors and one service ace. The Rams would have their own serving woes and at one point of the set when the Falcons were down (6-12) there would be back, to back, to back, to back service errors. That is correct, there were 4 consecutive service errors, two performed by each team. However, the Rams would still cruise to a (25-14) set. The third and final set was the closest of the night with the Falcons sticking around all the way up to (18-20) before the Rams would go on a (5-0) run to finish off the set, as well as the game (25-18). The big highlights from the game were the number of errors the Falcons had as well as the hitting percentage they put up in comparison to the Rams. Air Force had 19 errors while the Rams had 14 with a 21% higher hitting percentage. A large part of that was Breanna Runnels having 16 kills, 2 errors off of 30 attempts coming out to a hitting percentage of 0.467 and Kirstie Hillyer with a hot start of 11 kills off of 19 attempts and 4 errors ending with a hitting percentage of 0.368. The Falcons best percentage hitter of the night was Abigail Miksch with just a percentage of 0.190 off of 21 attempts and two hitters of the Falcons ending the night with a negative hitting percentage. The Rams get to take the week off before facing both the Boise State Broncos and the Utah State Aggies at home, October 11th and 13th. The Air Force gets to return home to also play two teams on October 11th and 13th, the San Jose State Spartans and the Nevada Wolfpack.